Books are something that everyone enjoys reading, especially since there are a variety of genres to choose from. Would you like a book about animals? How about mysteries? Or a travel guide? Perhaps a photography book? These days however, the craze is all about YA. It must have started with the Twilight trilogy. It’s not surprising if you think about it. Twilight is a very successful franchise! There are four books and four movies I think? Or five books? Five movies? Eh, I’m not sure. The point is, this is a book based on the writer’s dreams, that became hit enough to be turned into movies, and then those movies inspire an entire spoof movie. That’s like a mini jack pot, considering the Harry Potter franchise must be THE jack pot! Anyway, once Twilight came out, there’s been a lot of books that have been roaming around most bibliophiles’ orbit, all Young Adult novels with elements of the supernatural. I’ve decided to review one of these books, mainly because I have issues with the story that I feel should definitely be talked about. I’ll just tell you about what disturbed me about this book. Basically, it involves Nora, the main character who is a bit of a nerd. And every nerd going to high school is supposed to have a bully. In Nora’s case, it’s Marcie, the classic rich girl who just loves bullying one particular person. Like I said before, wonky polygonal relationships are very difficult to execute- and this was not well written in my opinion. But we’re not here to to talk about to character analysis and sketches. 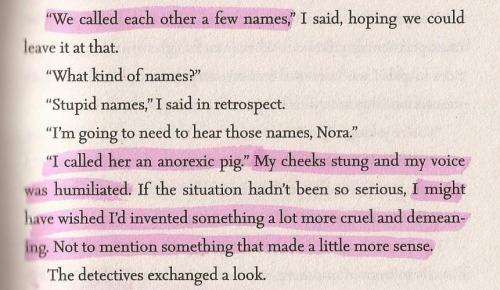 What I wanted to talk about was a recurrent conversation between Nora and Marcie, where they tossed around insulting slurs at each other before Nora finished things off with “anorexic pig”. This was my first time being exposed to the word anorexic. It was a word being describe a girl whose physique, when described, matched mine and for a full year, I thought anorexic meant skinny and the fact that anorexic was made to sound like it was a reason for being a bully really hurt me. Is that okay? No. That’s not okay. 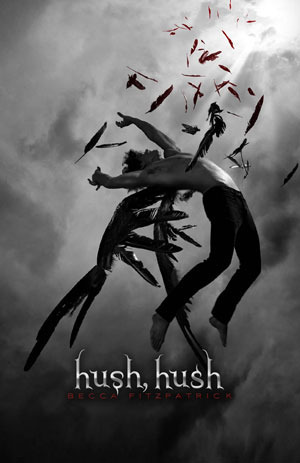 It’s great that Hush Hush affected me, but this was a very negative effect. If your book can do this to a seventeen year old, what will it do to someone younger? Someone fifteen, thirteen? Kids who are heading over to the YA section? We’re not even talking about all the other things wrong with this book? Oh wait, we should. 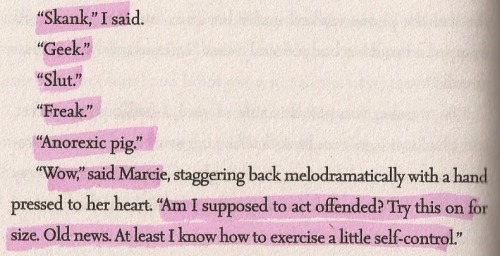 Nora is a bully herself (she wishes she thought up of a crueler and more demeaning insult for Marcie- not that anorexic pig is all rainbows and flowers, right?) and is generally a character who is difficult to like. You’d think she’d have some redeeming qualities but to be honest, it’s hard to see them when all you associate with this character is body shaming. Even Bella was better- she was polite and didn’t needlessly sling mud around. Patch is a stalker who says the creepiest things and is very very far from romantic- he’s a psychopath and should be avoided at all costs. Like, yeah I get it, he’s an angel and the plot is constricted and waterproof so it seems like what’s happening is the only thing that can happen for him, but that doesn’t change the fact that it’s really creepy! So yes, this book was, in my opinion, horrendous. I wouldn’t recommend this book to anyone. I’d tell the writer to please consider rewriting this saga. I’d tell the publisher and editors to please hand in their resignations or at least take a few literature classes to see what proper novels should be like. What kind of popular books do you find yourself disagreeing with? What issues do you find sensitive in young adult novels? Let me know in the comments below! Have a nice day! Posted in BookscommentLeave a Comment on Careful What You Write in YA Books! !